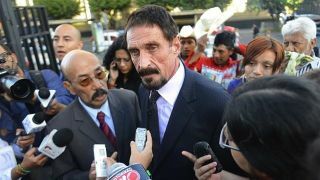 It looks like John McAfee, better known as the creator of the anti-virus software McAfee and one-time fugitive, will be running for president of the United States. While Wired earlier today reported that McAfee was still debating on running or not, according to CNN Money, McAfee has since confirmed his plan to run for president in 2016 and has created his own party, the Cyber Party. As expected, Twitter has exploded with the news, where McAfee posted: "We will have our official announcement at 6pm Eastern tomorrow." He's also taken to social media to dismiss questions of if this is a publicity stunt, and has been retweeting and replying to posts related to the news. There's a mcafee16.com campaign site that links to Twitter, Facebook and Instagram accounts as well. As to what his campaign's main focus will be, he told CNN Money that he needed to run because he believes governments worldwide are "out of touch" and that people are "losing privacy at an alarming rate". He also told the publication that the US government "lacks an understanding of the basic technology that runs the world." We'll find out more details tomorrow with the release of an official statement.